This was the final week of the annual school supply drive, Tools 4 Seminole Schools, in which my Rotary club participates. Being involved in the effort gave me another opportunity to think about how public school funding works in Florida. As I understand it, Florida funds public schools through a mix of money allocated by the state, the counties, the state lottery, various non-profits, and federal programs. Despite all of these sources, public education in Florida is underfunded. I have no idea how public education works in other states and countries. I would imagine the situation is mostly better as Florida ranks 29th in the nation on education quality. For school financing in particular, Florida ranks 45th. The United States as a whole ranks 25th in education. The region holding the drive in which I was involved is Seminole County. Seminole County has a 501(c)(3) non-profit organization, The Foundation for Seminole County Public Schools, whose purpose is to raise and distribute funds and in-kind donations for Seminole County Public Schools. My understanding is that most counties in Florida have a similar non-profit foundation whose purpose is to attempt to make up what is not covered by state and county taxes. It is this foundation which organizes the annual school supply drive. The drive is ostensibly for underprivileged students, but according to the foundation, over 54% or 35,000 students in Seminole County are in the free and reduced meals program and cannot afford school supplies. This is far from a small minority. This is a serious problem. The foundation runs a physical store stocked with school supplies. Teachers can then drive to this store and “shop” for free supplies for the students and classrooms. Teachers often spend their own money to supply their classrooms and students. Neighboring Orange County has a similar foundation and physical store. This is apparently a common approach to work around the failures in public school funding. It is completely ridiculous and unconscionable that we have teachers play quartermaster for supplies. If these supplies are needed, they should be in the budget and that budget should be paid for with taxes. To ask teachers to work on their own time is unreasonable. If they are doing it on some non-classroom paid time, that time could be better spent teaching students. The terrible performance of the United States education system relative to other developed countries and the failure of the electorate to sufficiently fund public education are probably correlated. This is a huge waste of labor on the part of teachers, the staff of the foundation, and all of the people raising money. We should just raise property and/or sales taxes enough to properly fund the school system. Every child attending a public school should not have to worry about school supplies, nor should their teachers. The foundation and others like it should not exist. The existence of the foundation highlights a failure in our system. Just to be clear, I am not criticizing the people who work at the foundation and similar organizations. These people are doing a great job to make up for a failure in governance. I am told by local educators that they are struggling to pay for construction, salaries, insurance, technology, and vocational and academic programs. I am 46 years old. I was born in Florida and have lived here my entire life. In public school career, many classes were held in temporary buildings because the schools were not big enough to accommodate the number of students. It is still true that many students attend classes in temporary buildings. Florida has been growing rapidly for my entire life and I have not seen a local government properly plan for that growth. Now we have a state lottery system, in a state where gambling is illegal without special permits. The lottery is a terrible idea. The majority of lottery revenue comes from people who can ill-afford to be spending it and probably could have used some better teaching on statistics. Worse, now that the lottery is firmly entrenched, there is less motivation for local governments to fix school funding more appropriately. What was intended to supplement funding from taxes has now supplanted it. Asking voters to approve increases in taxes is always difficult. Florida has a tougher problem than most states though. We have a very large retiree population that migrated here in part due to our low taxes. These voters have no incentive to approve higher taxes for roads and schools. They have no children in local schools and they do not need to commute to work. They outnumber those who have to raise a family here. I have lately been, half-jokingly, making a modest proposal to various legislators and those running for office: That we do not automatically allow those immigrating to Florida to vote; that the franchise should be afforded to only those who have skin in the game. If one has children here, works here, or owns a business here, one would get a vote. I usually receive horrified responses to this about it being unconstitutional. Fine, let’s amend the constitution. Of course, I am not serious about actually doing this. US history has proven that the electorate cannot be trusted with gatekeeping who is allowed to vote. What I do want is for people to think about how we manage public funding in a system where people can take advantage of living in an area without contributing to the infrastructure and maintenance. If we cannot stop retirees from moving here and voting down any improvements, then let’s have a moratorium on building permits. There is no good reason why we should not have schools being built and funded at the same speed as housing. There is a lot of anxiety right now about the huge changes happening to our economy as robots and software eliminate jobs at an increasing rate. Communities and countries that prioritize equality of opportunity will invest in education. They will invest in the necessary infrastructure of the information economy or be overtaken by those that do. The best thing we can do for young people is to ensure that they have excellent education. We are failing at that. This is unacceptable for a country that consider itself to be rich. Throwing more money at any problem is not necessarily the answer. According to the PISA results I mention above, the top nations in the world for education are all socialist or command economies with lower GDP. Our GDP and cost of goods in services in dollar terms is higher; our education spending should reflect that. It is not a matter of total dollars, it is percentages and priorities. Our culture does not value public education. If you use macOS, I have a little script that you might find useful. I use this at least a couple times every workday. The Mac has great PDF workflow functionality. I will often be editing a document and want to send it out via email (or chat) to others who just need to review it and not edit it. I have no idea if they have the application I am using, so I want it to send it in PDF format so that they can reliably open it. What I usually want to do is to “print” the document as a PDF and then attach that to the email. I used to do this a lot and would then have to clean up and delete the PDF files as I did not need them. Not to mention, there were lots of intermediate clicks and mouse movements to save and then open the intermediate file. 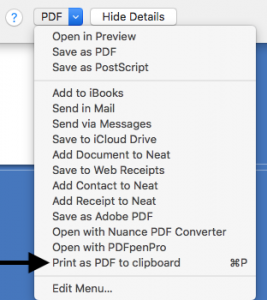 What I really wanted to do was to print as PDF directly to the clipboard. Then I just paste into the email or other destination application. That saves a few steps and clicks and mouse movements. I wasn’t sure how to do this, so I asked on Stack Overflow and received a very useful answer. I put together a script based on that answer and have been using it for over seven years. I have put the source code up on GitHub. Feel free to make any improvements and send me a pull request. You can download an easy to install version. To make this even better, I have added a keyboard shortcut bound to ⌘-P to execute this script. So printing the current document to the clipboard takes nothing more than pressing ⌘-P twice. Then I can Alt-Tab over to the destination application and press ⌘-V, no mouse movement or clicking needed. 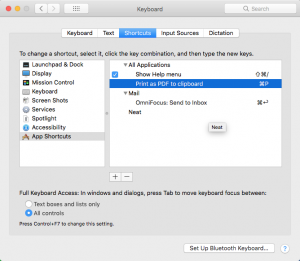 To do this, go to System Preferences→Keyboard→App Shortcuts, and add a shortcut with the exact name “Print as PDF to clipboard”. Today I encountered a clerk becoming annoyed with the behavior of a customer. I shared with him a technique that I have long been using in similar situations. It helps me maintain a pleasant attitude. When someone does something inconsiderate and annoying (e.g., as often happens when driving), it is easy to assume that the offender is intentionally being a jerk. Consider instead the possibility that this person is a moron. Once you make this mental leap, you can imagine lots of ways in which everyday activities must be difficult and challenging for this moron. Think about his confusion as he notices other drivers successfully employ turn signals. 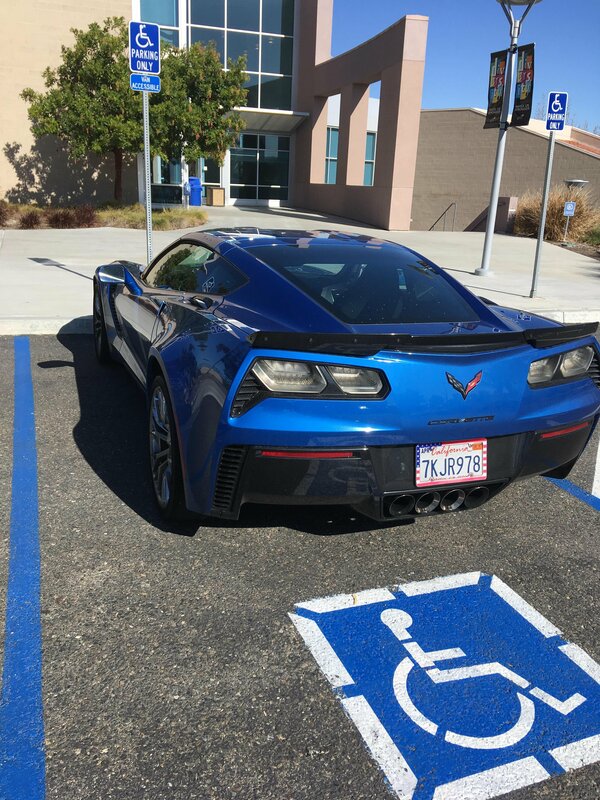 He probably has no idea of the purpose of many of the various levers and buttons in his car. That likely causes him ongoing anxiety. It must be rough to be him. Maybe he does not know that his mobile phone can be used in any configuration other than as a speakerphone. Imagine what other frustrations he must have with technology and the modern world. You can’t really be mad at a moron, just sympathetic. Instead of giving in to anger, smile and speak more slowly, as you would to anybody with a cognitive disability. Be kind to morons. 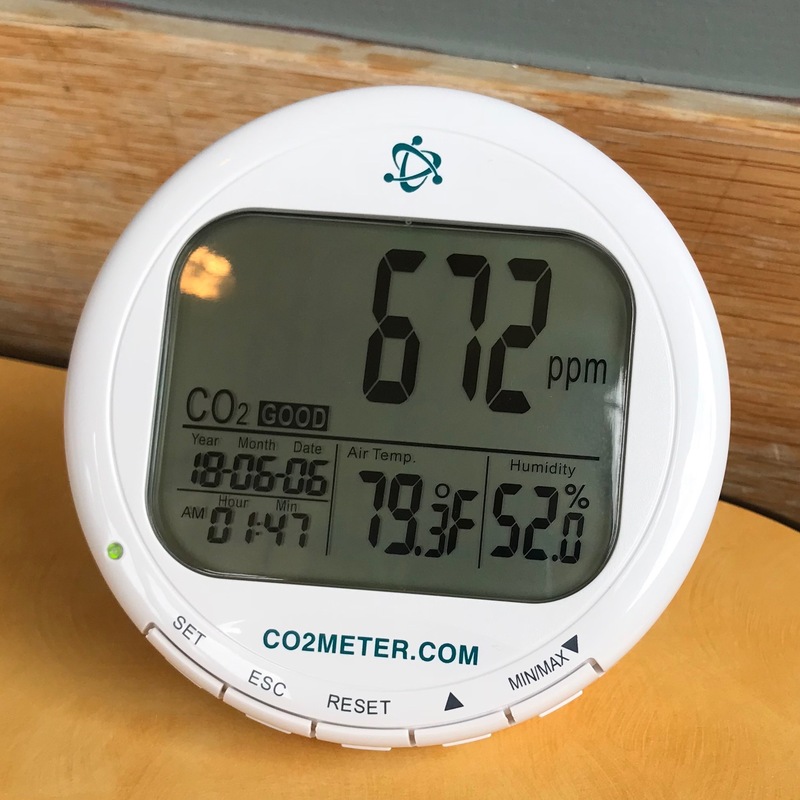 A few weeks ago I ran across a post by someone who claimed that he had improved his productivity by installing a CO2 monitor in his office and opening the window when the reading went over 1000 ppm. There are measured decreases in cognitive function at 1000 ppm and lower. This made me curious, so I bought a CO2 monitor for my home office. The monitor clearly shows higher readings when the doors have been closed for a while. I have had the alarm sound at 1000 ppm when exercising in the same room with it. Now when I see the reading go above 600, I open a door for a bit. It makes a noticeable difference on the monitor very quickly. I don’t know if it is making me any more productive, but I at least have not felt unusually tired since starting this protocol. It could be entirely psychosomatic, but I will take every benefit I can get while trying to do difficult work. This has been making me wonder how poorly office spaces and schools are designed for cognitive work. We are at a point in history where we have very well sealed environments with people in them trying to do more cognitive work than ever before. This trend will only continue. Every space housing people should be monitoring CO2 (and probably other attributes, like VOCs) and fixing things where the numbers are too high. Apparently the UK regulates CO2 in schools. I am not aware of any such regulation in the United States. Here in Florida, primary school students are lucky to be in a permanent building, so I do not expect that any exceptional investment is being made in ventilation. Yesterday I carried my CO2 monitor around to various meetings in different places (much to the amusement of those with whom I was meeting). Every place I checked was at least 200 ppm higher than outside. In one office, two guys are working in a room that read over 1,500 ppm. I wonder if they would be more productive with proper ventilation. I wonder how cheaply such monitors can be made. Could they be made small enough to fit in a smartwatch?